At the Daily Beast, Michael Moynihan attempted to overcome the tendency of journalists and celebrities to make Nelson Mandela a secular saint. Moynihan recalled that when Margaret Thatcher died, these same people denounced her for here "indulgence" of right-wing dictators like Agosto Pinochet in Chile, who allowed his country to become a democracy. So Mandela was painfully slow in denouncing the squalid dictatorship of Robert Mugabe. He was rather fond of Cuban dictator Fidel Castro (it won’t take you long to find photos of the two bear-hugging each other in Havana) and regularly referred to Libyan tyrant Muammar Qaddafi as “Brother Leader of the Revolution of the Libyan Jamahariya.” It was on a return visit to Robbin Island, when Mandela, as president, announced with appalling tone deafness that he would invite both Castro and Qaddafi to South Africa. A MediaWatch study of evening news coverage of Mandela's release during the first three weeks of February found that reporters often compared Mandela to the Pope, Jesus Christ, and Moses, but not one story discussed Mandela's embrace of communism and only a few CNN reports mentioned his role in acts of terrorism. MediaWatch analysts found the same thing in network morning news (ABC's Good Morning America, CBS This Morning, and NBC's Today) and evening newscasts (ABC's World News Tonight, CBS Evening News, CNN's PrimeNews and NBC Nightly News) from June 17 to June 30. In 142 news stories, network anchors and reporters ignored Mandela's embrace of communism and his terrorist past. Instead, Mandela was hailed as "the hero of oppressed people everywhere" (David Ensor, ABC); a "larger than life figure" (John Holliman, CNN); and "a virtual symbol of freedom" (Harold Dow, CBS). On June 24, NBC's Brad Willis described "A huge rally on Boston's esplanade for a freedom fighter that many compare to the revolutionaries who fought against the British here more than two centuries ago." But what didn't the reporters cover? Communism. In their rush to proclaim him a symbol of freedom, none of the networks covered Mandela's ideology or the relationship between Mandela's African National Congress (ANC) and the South African Communist Party (SACP). In his own handwritten manuscript How To Be A Good Communist, Mandela wrote "Under a Communist government, South Africa will become a land of milk and honey." With the exception of NBC's Bob Kur and Mike Jensen, no reporter even mentioned Mandela's support of economic nationalization. With Mandela's ideas and "loyal and disciplined" membership in the ANC, would South Africa become a multi-racial democracy or a one-party Marxist state like its neighbors? No one asked. Political Prisoner. "The former long-time political prisoner will address Congress," Dan Rather announced when Mandela arrived. TV reporters called Mandela a political prisoner eight times, but never referred to Mandela as a saboteur or terrorist, even though Amnesty International declared in 1985 that "Mandela had participated in planning acts of sabotage and inciting violence, so that he could no longer fulfill the criteria for the classification of political prisoners." Network reporters did report Mandela's refusal to renounce violence in 14 stories, but most referred to it only in the context of fighting apartheid, not in the context of the ANC's involvement in black-on-black violence or the indiscriminate killing of innocent civilians. Arafat, Castro, Qaddafi. Without Ted Koppel's June 21 "town meeting" with Mandela, the tour might have escaped controversy completely. Questioners asked Mandela to explain his praise for Yasser Arafat, Fidel Castro and Moammar Qaddafi. The questions were prompted by Mandela hailing Castro's Cuba in May: "There's one thing where that country stands out head and shoulders above the rest. That is in its love for human rights and liberty." A week later in Libya, he praised Qaddaf's "commitment to the fight for peace and human rights in the world." These statements, which appeared in The New Republic, were never quoted on the networks when he said them, or when he visited here. The networks barely reported Mandela's ABC remarks until Jewish and Cuban groups and print outlets made them an issue, mentioning the controversy in 26 stories. ABC, which taped the Koppel special in the afternoon on June 21, didn't find the remarks worth including in a story on that night's newscast summarizing the "town meeting." The next morning, Good Morning America did one story on the remarks, but left it out of its three other newscasts. NBC's Today aired three stories without mentioning the remark. Harold Dow left it out of the one story on CBS This Morning. In fact, NBC and CBS dropped the Mandela story from its morning news for the next two days. On the Evening News, CBS gave the remarks brief mentions on June 22, 25, and 28. NBC Nightly News spent 45 seconds on the remarks on June 22, and included brief mentions on June 24 and 26. But the show ignored Mandela from June 27 to 29, when Mandela was greeted by thousands of protesting Cubans in Miami. ABC's World News Tonight was the only newscast to question Mandela's contentions. Reporter James Walker noted: "Many find it a paradox that Mandela asks Americans to involve themselves in South Africa's internal affairs while he refuses to pass judgment on the internal affairs of Libya or Cuba, or to involve himself in America's racial problems." But Peter Jennings dampened the impact with his remark on Castro: "The Cuban President has long been a leading supporter of liberation movements in southern Africa." Puerto Rican Assassins. The networks never reported some other terrorists Mandela praised. He welcomed to his Harlem speech platform three of the four Puerto Rican terrorists who shot and wounded five U.S. Congressmen in 1954. "We support the cause of anyone who is fighting for self-determination, and our attitude is the same, no matter who it is. I would be honored to sit on the platform with the four comrades you refer to." The quote appeared in the early local edition of The New York Times June 25, but the Times dropped it from later local editions and the national edition. ANC Antics. The networks have repeatedly failed to report recent events that give the Mandela legend a less lyrical ring. When a South African court implicated his wife Winnie in the beating and murder of a 14-year-old, only CNN PrimeNews briefly noted the incident. ABC, CBS and NBC have ignored it. On June 11, ANC members murdered Sipho Phungulwa in apparent retribution for Phulungwa's public allegations that the ANC tortured and killed dissident members. The networks have never mentioned it. ABC's Don Kladstrup was the only reporter to put Mandela's importance in South Africa in context: "Mandela is not the undisputed leader of all South African blacks." Kladstrup reported that more than six black organizations are fighting apartheid, and interviewed black activists who said "Heaven help us if the ANC takes over here" and "If you do not go along with them, they will run roughshod over you." Kladstrup reported: "Many complain: why does Nelson Mandela talk with President de Klerk, but refuse even to meet with Chief Buthelezi, leader of South Africa's Zulus?" Kladstrup wondered whether a multi-racial democracy would emerge: "Many fear not until blacks remove the wall of intolerance that now divides them." 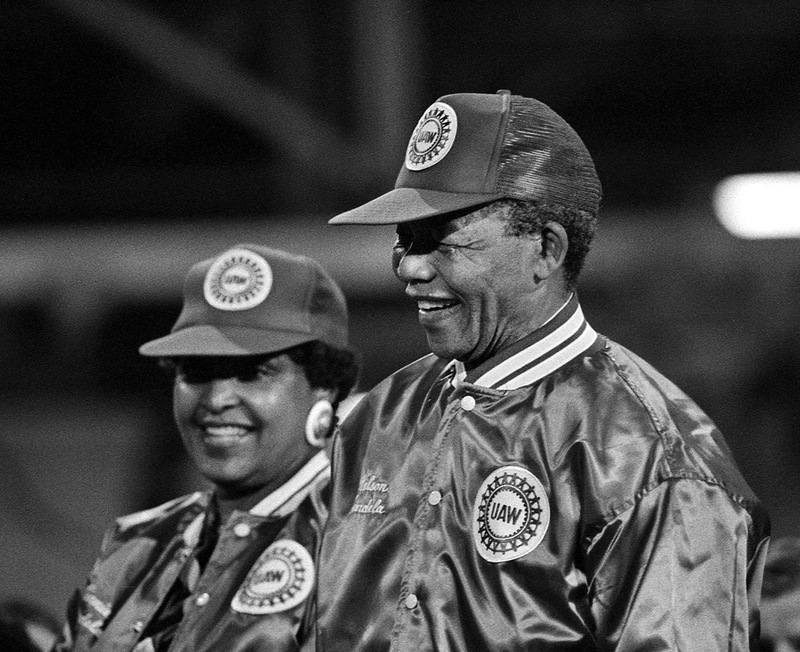 Did the networks realize how much of the Mandela story they missed? David Ridenour of the National Center for Public Policy Research wrote to the networks about their refusal to report the seamier side of Mandela or cover the Americans who protested his visit. NBC Nightly News Executive Producer Steve Friedman, whose program offered the least coverage of Mandela and didn't even cover Mandela protests in Miami, responded: "We have pointed out what Mandela said and what he stands for. I have to say you must have missed that part of the program."